Many I speak to on these subjects agree that we are totally depraved, that God elects sinners for salvation, and that He is the Good Shepherd who will finish the work he began in us. We are, therefore, relatively “reformed” in our theology together…which is an interesting label considering that, from our perspective, should probably be labeled “recovered” theology as this teaching was changed by the institutional church early on in Church history and was reaffirmed during the Synod of Dordt as the common, ancient, and Biblical doctrine of salvation. However, debate continues amongst reformed theologians and we lowly lay people about atonement. Did Christ die for everyone or for the elect and why do we care? 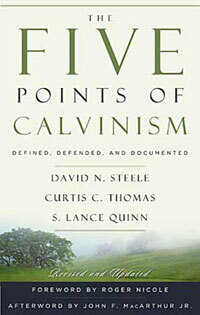 First, the “Five Points of Calvinism” includes the third of five points commonly called “Limited Atonement.” Many people call themselves “four-point Calvinists” because they believe in all of it except this very controversial third point. With the context of the other four points in mind (we’ll get to four and five soon! ), let’s consider the third point – Limited Atonement. I believe that everyone limits atonement. Most churches in Western Christendom teach that Jesus died for “ALL” men – that Christ’s work made it possible for all to come to Him. They would say that “Christ died to save all men if…” and follow this with any number of qualifications, actions, or reactions to the Gospel. I would throw this out for thought: everyone limits atonement. You either limit it in extent/scope (Christ died for the elect) or in effectiveness (Christ died for all but redemption needs you to…). I also would throw out that Christ’s death was obviously capable of saving every person who ever lived…but He didn’t choose to die for that purpose. “The Scriptures describe the end intended and accomplished by Christ’s work as the full salvation (actual reconciliation, justification, and sanctification) of His people. The Scriptures state that Christ came, not to enable men to save themselves, but to save sinners. The book goes on to list a number of other verses that seem to suggest that He came to sacrifice Himself for those who were called to be His. Pick up the book and pour through it with an open mind. You’ll be blown away – even if you already believe in four or five Points. If you take the multitude of Scriptures that declare He died for His people, His elect, His chosen race and then consider the cultural and spiritual climate at the time of the Scriptures; wouldn’t it make sense that the inclusive words “all” and “world” may have been used to combat the notion prevalent amongst the Jews at the time that only Jews could be saved? Could the Scriptures be reiterating that Jews AND Gentiles are among the elect? That the whole world is worth reaching out to with the Gospel in order to bring the message of salvation to those He has predestined? So…who cares? If God chose some and not others and died for them, what does that matter? If we are both believers and disagree on this…so what? Aren’t we both preaching the Gospel and is it profitable to have this discussion? This discussion has caused division in the past, so why rehash it now? 1. For the believer with a Biblical view of election and perseverance, it is easy to look at the “Arminian” and shrug his/her shoulders. Either way the message of Jesus is being preached; even if those who don’t feel the way the Calvinist does may live with a distorted picture of how salvation works or the character of God as relates to His chosen race. The Gospel of Jesus gets preached and we are brothers. But to those who don’t share the views of the Calvinist it is easy to look at the Calvinist as fatalistic and unwilling to reach out. Few things are more misunderstood than reformed theology by those who don’t share the same views. Discussing this respectfully brings Arminians – if not to the ‘truth’ – to a realization that Calvinists embrace evangelism and Scriptures as much as they do. 2. “Calvinism,” for a lack of a better term, offers a doctrine of assurance and peace that is worth discussing. If we are right about election and atonement, it offers so much more gratefulness and peace to the weary soul. Isn’t the very nature of God and His plan for us worth discussing? Isn’t the very heart of how we are saved worth exploring? I think the problem has been in how we have discussed this issue – not whether or not we should. If you don’t believe in all “Five Points of Calvinism,” that’s not a hill I want to die on with you – you are still very likely chosen as a fellow Christ-follower. If I limit atonement, however, I want to limit it to Good News that you are redeemed…not limit it in effectiveness and put a burden of “if you…” on the searching soul. The Scriptures seems clear – Jesus died for the elect. Christ’s death was designed to secure salvation, not to simply make possible election. Galatians chapter 1 says that Jesus “gave himself” for our sins “to deliver us” from evil according to “the will” of the Father. If he delivers whom He elects, than His will was for Christ to die in order to deliver. It doesn’t say He gave Himself so delivery was possible. Note also that in John 17 (verses 1-26) Jesus prays not for the whole world’s population but for those given to Him by the Father. He says “I am not praying for the world but for those whom thou hast given me.” Read the whole prayer. If he died for more than the elect so that salvation was possible if…wouldn’t He have prayed such? Ephesians 5 paints the picture of limited atonement when Paul exhorts husbands to love their wives “as Christ loved the church and gave Himself up FOR HER, that he might sanctify her…” The relationship of husband and wife is a picture of Christ laying down his life…for His Bride! You are currently reading Limited Atonement at Eric Goranson.